I have always admired the high-heel wearing skills of ladies who can don skinny stiletto pumps and click-clack around town on those slender heel tips. I think the last time I really did that was back in 2013 when I went to a wedding and wore black satin peep-toe pumps with a skinny heel. I managed all right that day but I never trust that shoes like that are going to hold my weight when I take a step! Because I like something sturdier when I am wearing heels, I normally prefer block heels and when I was looking for a pair recently I noticed that there was no shortage of them on the market! 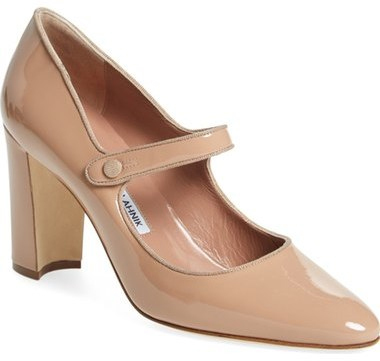 I bought the Bandolino ‘Oceana’ pumps, above, from DSW, and they are pretty comfortable, with a 2.5 inch heel. 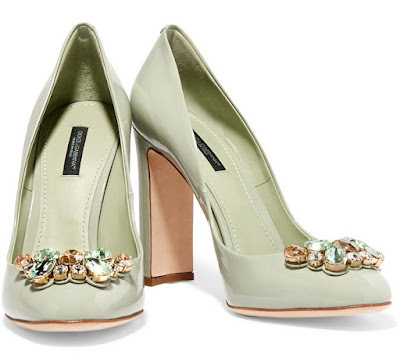 I really like the ‘Campy’ Mary Jane by Manolo Blahnik, below, but they are way out of my price range and too tall anyway. 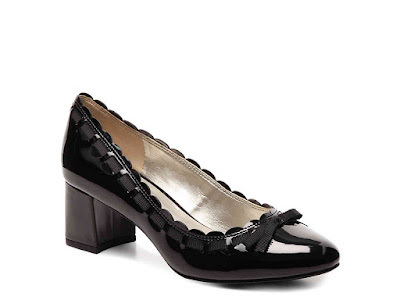 Love these Mary Janes by Manolo Blahnik but make mine black! And lower! 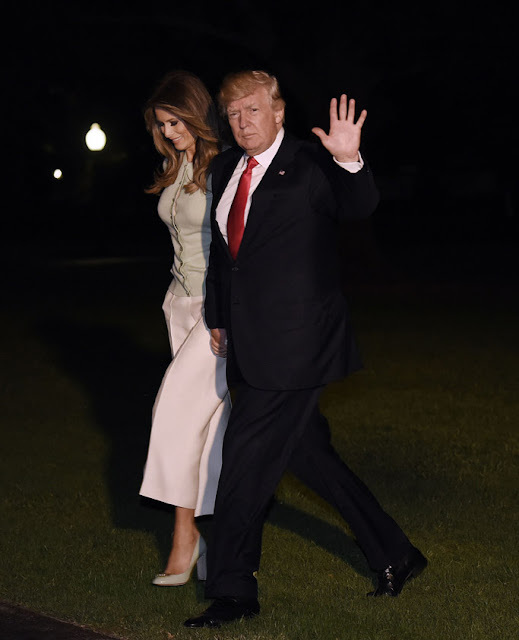 Melania in the kind of sky-high heels she seems to prefer. I would have to sit to wear these too! 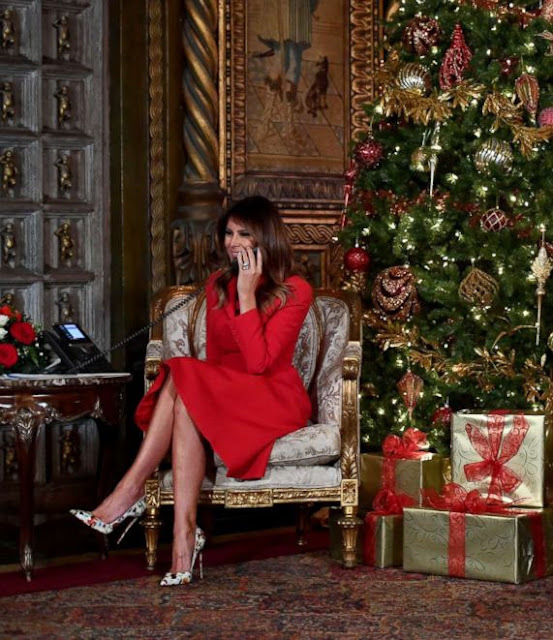 It seems like Melania has worn nothing but stilettos in her first year as First Lady. The photo above was taken of her at Mar-a-Lago on Christmas Eve—and I do love those floral pumps (which I think are by Christian Louboutin)—but one pair she wore that I actually love a lot more are the bejeweled block heeled pumps by Dolce & Gabbana she had on last May. In fact I loved the whole outfit of cardigan, white cropped pants, and the block-heeled pumps embellished with faux gems. It looked comfortable and elegant and easy. Not to mention I love mint green with white! Love these by Dolce & Gabbana but cut them down to 2.5 inches! Great block heels on Melania (still can’t believe that guy next to her is president). Are you a stiletto gal or do you like block heels? Or both?!? Let me know what you think of block heels and if you know a brand that makes a pair which are are especially comfortable, please share! Loving that Manola Mary Jane!!!! I hear those Bandolinos have a steel shank & toe and are de rigeur for any stylish gal conducting maintenance on heavy equipment. My Dear Jill, it's high time GSL declutter your closet of these pilgrim shoes and capris!